GS Avanti is a cycling club based in Orpington, South East London. 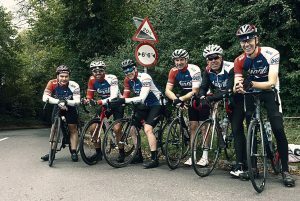 We are one of the friendliest and most welcoming cycling clubs in the South East, which is why we have a growing base of over 100 members from across London, Orpington, Bromley, Kent, Surrey and Sussex. The main attraction of joining GS Avanti is that our club rides are led by experienced cyclists and head straight into the countryside to explore some of most beautiful cycling routes in the South East. A friendly, vibrant and welcoming atmosphere means GS Avanti provides the best opportunity to explore the North Downs with other passionate cyclists. With four groups of varying speeds and distances to choose from, it is easy to find a ride that’s perfect for you. We host a variety of cycling activities and events and our mission statement is to provide “fun and friendship” through cycling. The best way to find out more is to try one of our Club Runs. Just turn up, introduce yourself and we’ll look after you. For any questions, feel free to contact us.